* Geology Guy on Strata Deposition: RSR host Bob Enyart interviews Ian, a research assistant to Guy Berthault, one of the daring scientists who do actual research on how sediments are deposited, rather than just accepting the now falsified story about superposition as told by Nicolas Steno. * However, It Was Liquefaction That Formed the Continent-wide Flat-Gap Strata! 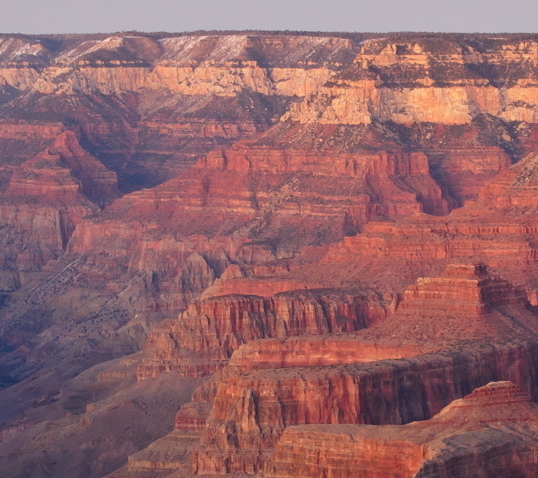 [2018 Program Note: Beginning at 28 minutes into RSR's Initial Conditions program on the Grand Canyon, Bob and Bryan Nickel describe how the amazingly flat gaps of the paraconformities (parallel strata) of the canyon formed.] on While Berthault's documentation of the amazing sorting ability of flowing water explains some of the world's stratification, there simply isn't enough energy available for flowing water to explain sorted strata that is thousands of feet deep across vast regions. Much of the world's continental surface is covered with beautifully uniform and "flat-gap" boundaries (as though formed by a putty knife) between sediments over hundreds of thousands of square miles around the globe. To a significant degree, these flat boundaries between strata are the result of liquefaction sorting after burial of minerals (along with animal fossils and vegetation in coal seams, etc.). Thus liquefaction helps to explain both the geologic column and the formation of highly purified (limestone, diatomaceous, etc.) deposits, through its potential for even virtually continent-wide sorting of minerals into differentiated layers. See rsr.org/liquefaction! An atheist physicist named "The Phy" at TheologyOnline.com traveled from Seattle to Denver for this debate and afterward wrote that even though he utterly disagreed with them, the young-earthers won the debate. That night after the event, John Nicholl asked Enyart, "If the earth really were young, and had recently experienced a global flood, that would mean that geologists should give governments greater warnings about earthquake risks. So do you think we should do that?" Bob answered, "Yes, governments should be warned of earthquake risks greater than that predicted by old-earth assumptions." Since that debate there has been 462,000 earthquake deaths. See Also: Regarding this topic as a falsification of long ages, see also creation.com/flat-gaps!